Radio Mounted on test plate prior to being inside the flow loop. This study investigates the performance issues associated with the use of handheld portable radios by fire fighters working in elevated temperature environments. Radios may be vulnerable to elevated temperatures that can be encountered during firefighting activities. 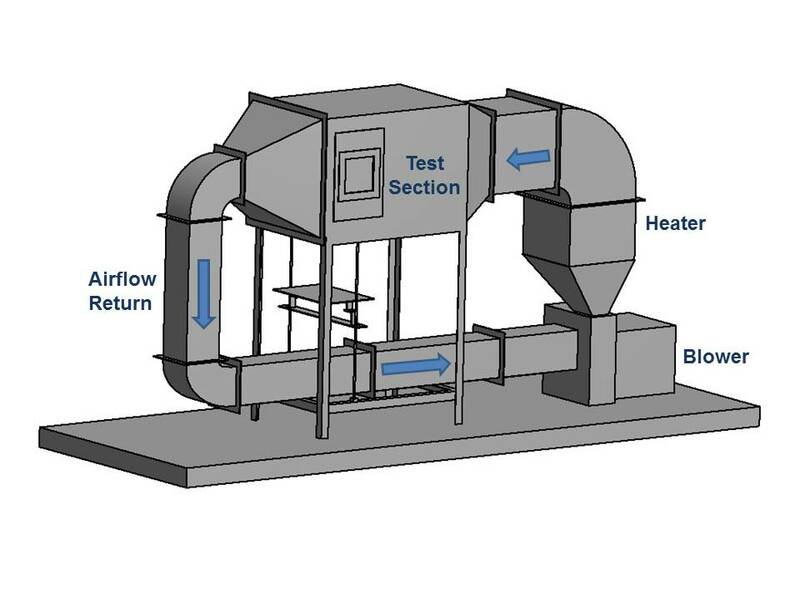 Controlled, repeatable, well characterized test methods were used to measure radio performance. The radios were exposed to elevated temperature environments for specific temperatures and times. At Thermal Class I conditions of 100 °C for 25 min, all of the radios tested maintained frequency stability. At Thermal Class II conditions of 160 °C for 15 min, all of the radios tested experienced signal drift of the mean maximum power frequency. Some of the radios stopped transmitting during the testing. The objective of this project is to conduct research on the development of technology to track first responders as teams enter and move about single and multi-story structures. The results from this research will set the standards for reliable tracking systems that will allow incident commanders, both fire service and law enforcement, to monitor operations in real time. This effort extends research already underway to examine the capabilities and limitations of different technologies in a number of different scenarios. Each of the existing technologies have limitations, so currently, no system based on a single technology appears to address all scenarios and conditions. It may be necessary to combine multiple technologies, such as Ultra-Wide Band (UWB) and Radio Frequency Identification (RFID), or ad hoc networks and RFID, in order to allow continuous tracking of teams in wood, steel, and concrete structures and differentiate between different elevations, floors and roofs. Are there additional technologies such as ultrasonic-based systems that may provide acceptable performance? Ad hoc networking, sometimes called mesh networking, has often been mentioned as a solution for adapting a radio network to the requirements for reliable communication in an unpredicted network deployment or topology. However, indoor deployments of firefighters do not necessarily support a mesh (grid) of networked radios, and the line of relays from inside to outside, sometimes called "breadcrumbs," is a difficult topology for radio access protocols. 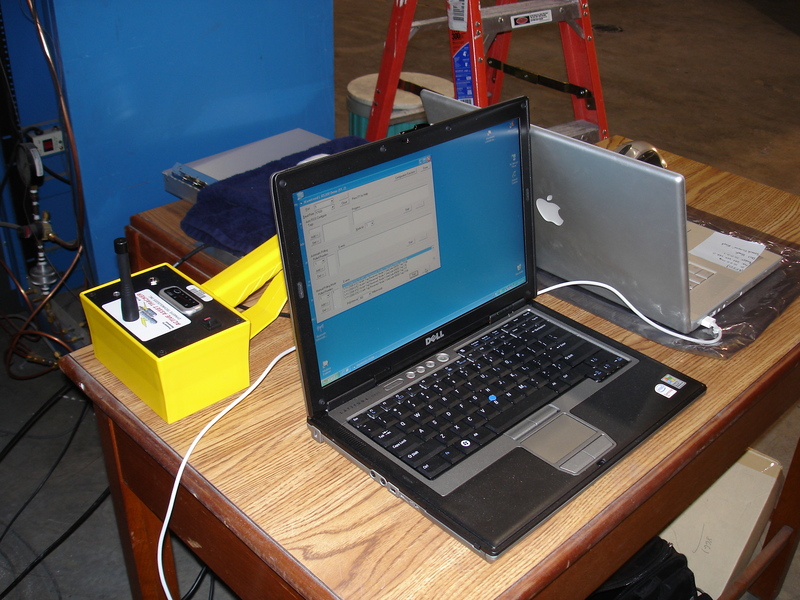 In order to implement 3D tracking using UWB systems it is necessary to provide performance metrics for non-line-of-sight localization of emergency responders and create a comprehensive digital library of experimentally-derived building material electromagnetic penetration properties that will enable the development of accurate 3D tracking systems for emergency responders operating within buildings. There are a number of companies that are currently manufacturing RFID tags and readers for tracking commercial items. RFID technologies need to be examined to understand what is the information storage capability for RFID tags, what is the fire fighter/occupant location accuracy as a function of reader locations, and what is the impact of building design and construction on reader performance. Monitoring the status and environment of firefighters and occupants inside buildings from outside the building is critical for managing the firefighting effort and pre-serving life and property. This research ex-amines the capabilities and limitations of different technologies including multi-nodal distributed systems, robotic pedometers, and ultrawide band radio tags. 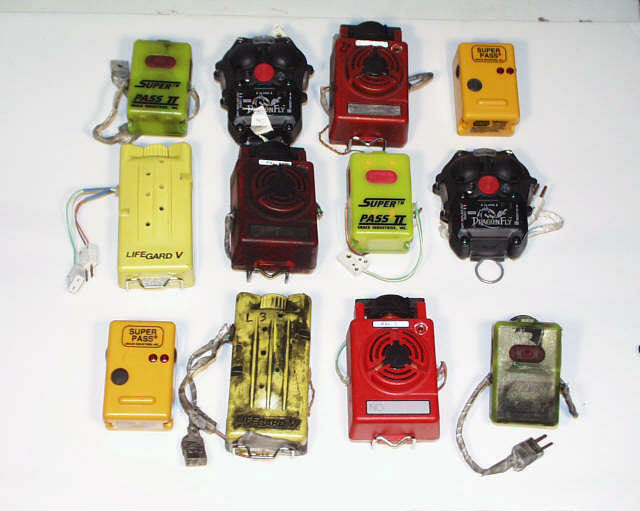 "For more information, read the report, "Structural and Electromagnetic Scenarios for Firefighter Locator Tracking Systems"
Different PASS devices from various manufacturers. Annually, hundreds of firefighters in the United States become trapped in structure fires, often resulting in injury or death. Firefighters can be quickly overcome by the heat or smoke of a fire and may be unable to alert other fire ground personnel to their need for assistance. Personal Alert Safety System (PASS) devices are designed to signal for aid via an audible alarm. Typically, PASS devices sense movement or lack of movement and activate a 95-decibel alarm signal if the lack of motion exceeds a specific time period. The loud alarm signal alerts other personnel that a firefighter has become incapacitated and it helps to guide rescue personnel to the location of the incapacitated firefighter. While the current NFPA Standard for PASS devices (1982) requires only a motion detector, some manufacturers are beginning to incorporate thermal exposure sensors into each PASS device. Some PASS devices are also being integrated into fire ground personnel accountability systems. 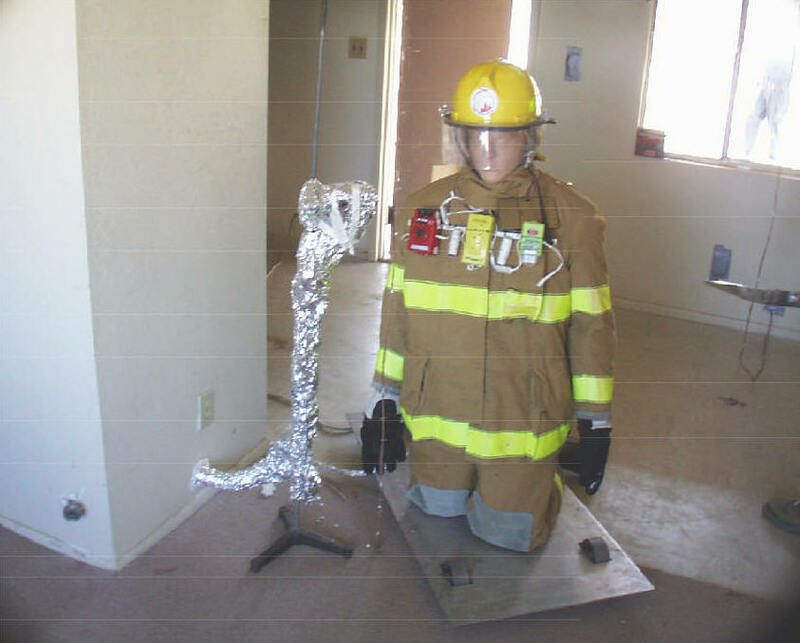 NIST's instrumented mannequin for full-scale tests. Developing standards for better PASS devices is part of the Fire Fighting Technology Group's continuing mission to improve Fire Fighter safety through research. 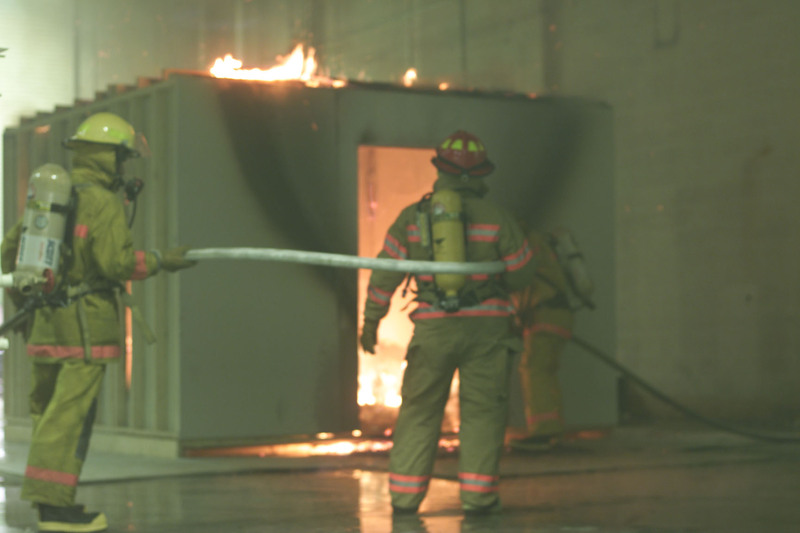 Advanced PASS device technology has the potential to greatly impact fireground operations by significantly reducing the risk of injury and/or death to Fire Fighters. This research will assess the current state-of-the-art in PASS technology and will examine specific enhancements, which may include elimination of false alarms, improve accuracy, linking to Global Positioning Systems (GPS) and/or personnel tracking systems, and incorporating additional sensors, such as thermal sensors or toxic gas analyzers. 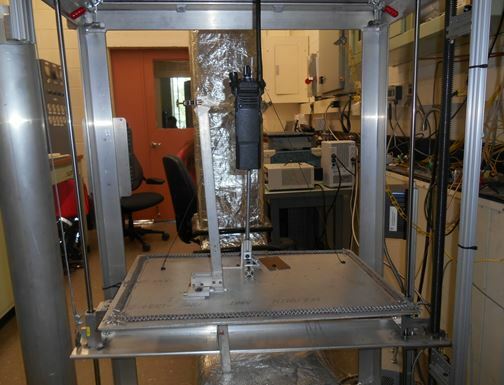 Four real-scale experiments were conducted by the National Institute of Standards and Technology to measure the temperatures above and below a wood floor assembly exposed to fire conditions from below. The objectives of the experiments were: 1) to examine the heat transfer through a wood floor assembly and 2) to examine the ability of a thermal imager to determine the potential severity of the fire beneath the floor assembly and the ability to provide a sense of the structural integrity of the floor assembly in order to provide improved situational awareness. Gas temperatures of the upper and lower compartments as well as the surface temperatures of the floor assembly were measured with thermocouples (TCs). 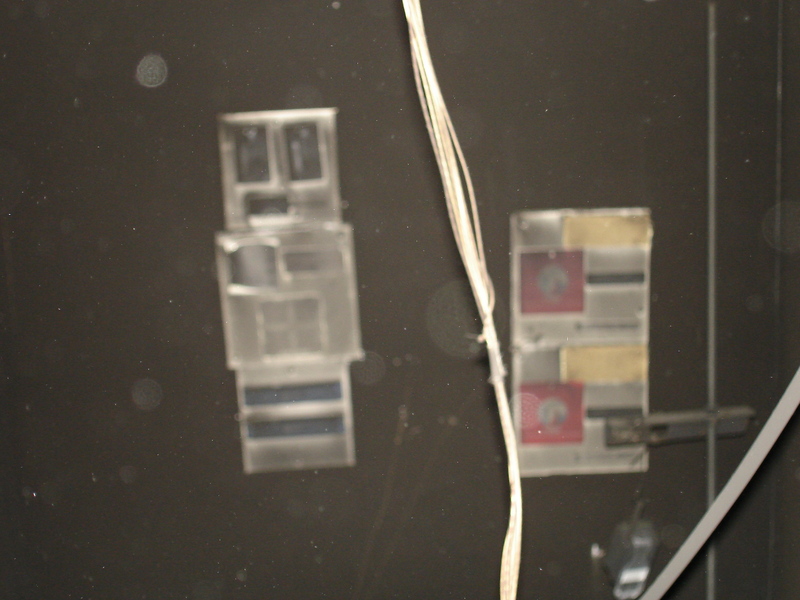 Three commercially available thermal imagers (TIs), each with a different type of sensor were used to view and record the thermal conditions of the top of the floor assembly from the open doorway in the upper compartment. Times to collapse of each floor were also noted. Given the insulating effects of the OSB and the floor coverings, the temperature increase or thermal signatures viewed by the TIs were small given the fact that the ceiling temperatures below the OSB were in excess of 600 ºC (1112 ºF). These experiments demonstrated that TIs alone cannot be relied upon to determine the structural integrity of a wood floor system. Therefore, it is critical for the fire service to review their practice of size-up and other fire ground tactics needed to enable the location of the fire prior to conducting fire operations inside a building. The United States Fire Administration (USFA) provided support for this project. 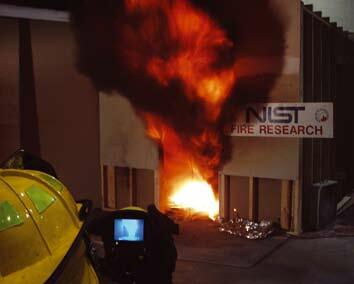 Testing the performance of Thermal Imaging cameras at the NIST Large Fire Facility. Infrared (IR) technology for firefighting applications has matured to the point that most first responder organizations in the U.S. either have purchased or are considering the purchase of thermal imaging cameras. Thermal imagers can provide first responders with critical information to size up a fire incident, track fire growth, and locate victims, other first responders, and egress routes. While these devices represent a significant investment, typically on the order of $10,000 per camera, first responders have little guidance on instrument performance beyond manufacturer literature and recommendations from other users. These issues are further complicated because the demands placed on thermal imagers are application dependent. The end users may have very different ideas about which imaging properties are most important: sharp image contrast may be sufficient for some firefighting applications, such as finding the source of a fire, but high thermal sensitivity may be required to locate a person or structural component when flames and water are in the imager's field of view. 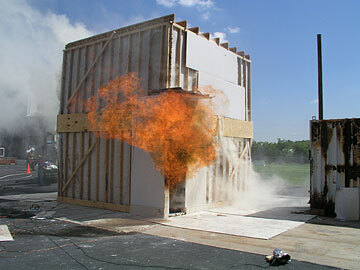 Over the past several years, NIST's Fire Research Division has been developing a suite of performance metrics and test methods for inclusion in a national consensus-based standard on thermal imaging cameras used by first responders. The performance metrics are related directly to the environment in which the imagers are used and tasks typically performed by first responders. Laboratory test methods to measure image contrast, effective temperature range, spatial resolution, image uniformity, and thermal sensitivity are currently included in the draft standard. While these objective laboratory test methods were being developed, a parallel effort was made to investigate the appropriate pass/fail criteria to apply to them. Work was performed in collaboration with the Firefighter views the opening to a furnished room with a thermal imager as the compartment flashes over U.S. Army's Night Vision and Electronic Sensors Directorate in which the quality of thermal images common to firefighting applications was related to the ability of firefighters to perform a task. In this way, human perception was used to determine the quality of the image while the imagers are tested using objective test methods. This work has provided a technology- independent basis upon which test methods for image quality were developed for NFPA 1801, Standard on Thermal Imagers, currently scheduled for release to the public in early 2010. The photos above show the comparison of three different thermal imaging detectors looking at the same view shown in the bottom right. Thermal imagers are needed by first responders for a variety of applications, including fire/hot spot detection and search/rescue operations. Although thermal imagers are becoming a common tool, they represent a significant investment and standards that assess the performance of these instruments is needed in order to help fire departments make educated decisions when choosing a thermal imaging camera. Manufacturer's literature does not provide consistent information upon which users can base purchasing decisions. Thermal imagers are challenged in two general ways: first by harsh conditions, in which the camera's thermal detector may become saturated, or in which the range of temperatures detected becomes too wide for the optics and/or electronics to operate at the highest resolution; and second, by conditions in which the camera's signal to noise ratio and thermal sensitivity become important, i.e. where surfaces, gases, and aerosols in the field of view are at near ambient temperatures. Standard test methods that capture the potential usefulness of thermal imagers to first responders operating in both types of conditions are needed. Measuring thermal imager performance also involves measuring the performance of the integrated camera system. Characterizing the contribution of the user displays to the overall package will allow a better understanding of where potential for improvement exists.